Some people learn the basic crochet stitches but never take the time to move on to the more advanced stitches. Although there are a number of things you can do with the basic stitches, it is important to learn the more difficult stitches if you wish to take on more elaborate projects. Use this guide to learn both the basic and advanced stitches so you can tackle any crochet project with confidence. 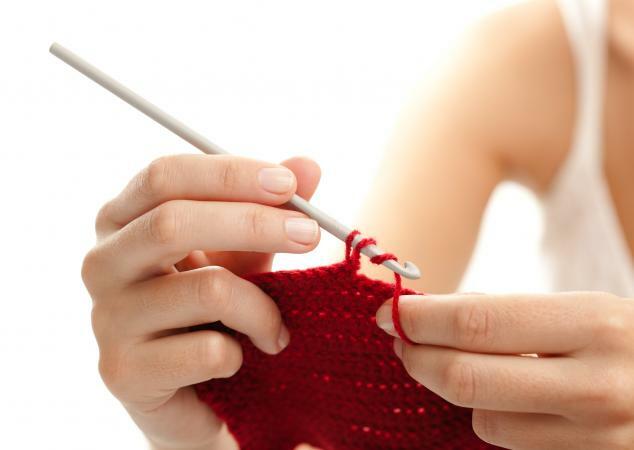 There are several basic stitches that combine to make many crochet projects. The foundation of all crochet is the chain stitch. Every pattern is built from the loops of the chain stitch, and every pattern will start with a command to "ch" a certain number of stitches. To make a chain, start with a slipknot, holding the hook in whatever way is most comfortable for you. There should be one loop on the hook after you make your slipknot. Draw the yarn over the hook (also called a yarn over or "yo"). Pass the loop that was on the hook over the yarn and end of the hook to create a new loop on the hook. Repeating this process forms a chain of loops. Continue until you have as many stitches as the pattern calls for. To practice, chain 10 to 20 stitches until you are comfortable with the movement and holding the hook. You can't make projects with chains alone. With a few more basic stitches, you can read, understand, and follow a pattern. In fact, once you've mastered the single and double crochet, you can teach yourself almost any other stitch. The next most basic crochet technique is the single crochet (sc). Form a single crochet on the second loop in the chain. Skip the first chain, and insert hook into the second chain. Yarn over hook and bring it through the chain stitch. Two loops are on the hook. Pull the yarn through both loops. Repeat the first four steps until you reach the end of the row. Chain one and turn the work. Single crochet in the opposite direction. Finish by sliding the last loop off the hook and slipping the yarn through it to make a knot. Represented by "hdc" on a pattern, half double crochet starts on the third loop of the chain. Wrap the yarn around the hook and insert it in the third loop. Yarn over and pull the yarn through the loop leaving three loops on the hook. Yarn over again and pull through all three loops on the hook. One loop will be on the hook. Double crochet (dc) is a little more complicated than the previous stitches. With the yarn over the hook, insert hook through the third chain from the hook. Yarn over and pull one loop through. You'll have three loops on the hook. Yarn over again and pull through two loops that are on the hook, leaving two loops. Then yarn over again and slide off two again, leaving one new loop on the hook. For some projects, you may need slightly more advanced stitches. All these stitches build on the basic stitches you have already learned. Triple crochet (tc), also known as treble crochet, is similar to double crochet but makes a really open, airy design. Bring the yarn over the hook four times. Skip three chains and insert the hook in the fourth chain. Yarn over and draw the loop through the chain. Yarn over and draw through the last two loops. A slip stitch (sl st) is a simple stitch that is used to connect rows of other stitches together or form a border. Insert hook into the stitch you wish to connect to. Grab the yarn with the hook on the backside of the stitch. Pull the yarn through the stitch and through the loop on the hook. A popcorn stitch, abbreviated as "pc," is a rounded stitch that combines multiple stitches to form a cluster. This textured stitch is popular for afghans and edging. Make a double crochet into a chain or previous stitch. Repeat and make four more double crochet stitches into the small stitch. Drop the loop from the last double crochet. Place the hook through the top of the first double crochet made and each of the double crochets. Grab the loop you dropped and pull it through all the loops on the hook. A V-stitch (v-st) is a lacy stitch that gives a decorative twist to any project. Insert hook into a chain stitch or previous stitch on your project. Make a double crochet into the stitch you went into. Make another double crochet stitch in the same stitch. Sometimes a project will call for a stitch to be made in the front of the previous row. This is called a front post double crochet (FP dc). Insert hook behind a stitch from the previous row. Wrap yarn around and make a double crochet as normal. Continue on each stitch to make a row of front post stitches. A back post double crochet (BP dc) is the same as a front post, but done on the back. Insert hook behind the first stitch of the previous row. Continue on each stitch to make a row of back post stitches. As with anything, it is best to practice each stitch until you are sure you understand how to make it before moving on to a crochet pattern. It is far easier to practice a stitch before starting a project than to have to rip it out if you make a mistake. Once you are comfortable with a stitch, it will become like second nature if you crochet frequently.